Marriage rates have fallen to their lowest level since records began in 1862, new figures show. 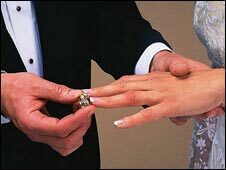 The number of marriages in England and Wales in 2007 fell by 3.3% compared to 2006, the figures from the National Office of Statistics confirm. The number of unmarried adults in 2007 rose, with 21.6 men marrying per 1,000 aged 16 and over, down from 23 in 2006. The marriage rate for women in 2007 was 19.7 marrying per 1,000 aged 16 and over, down from 20.7 in 2006. In 2007 there were 231,450 marriages compared with 239,450 in 2006. This is the third consecutive year marriages registered in England and Wales have fallen. This follows a long-term trend observed in recent decades, with the exception of an increase between 2002 and 2004. The statistics show in 2007, 143,440 marriages were the first for both parties involved, accounting for 62% of all marriages. Remarriages for both parties accounted for 18% of all marriages, which are similar to the proportions seen in 2006, the ONS said.